Provenance: The history of ownership of a valued object. Yard sale season has been a fun time so far this year and I have made more than a few great finds. Yesterday I found something really fun. I almost missed it because it was so dirty and just tossed on a table amongst a bunch of the usual crappy church sale donations. This guy is poseable rubber and he is marked West Germany on the bottom of a foot, or claw. What makes this little guy a stand out though is his Provenance. When I took him up to the check out table manned by the requisite senior citizen church members one of the ladies volunteered "I brought that, he belonged to me. I've had him since I was a baby". He wasn't priced and just how much did she want to charge for him? "Oh, just give us 10 cents". Susie, You found a treasure! It is always good to know who owned something…weird that she wanted to part with it, but that just means that it was meant to be yours. Um, so the stork is visiting your house? 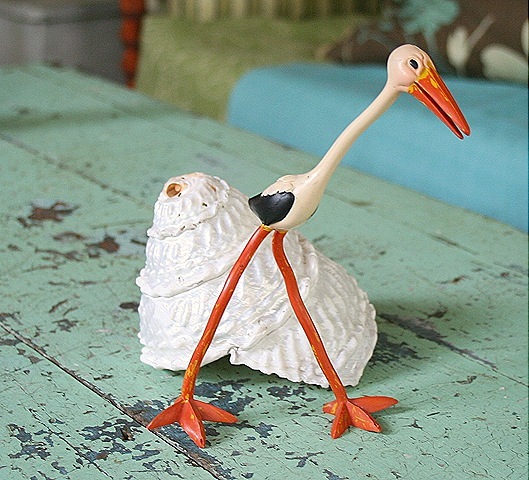 Love the stork and love the story even more! 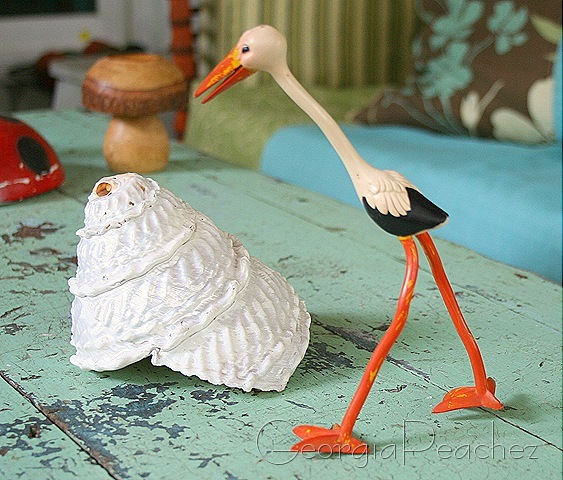 You got a gem with that fellow – I collect storks and have not seen one like that before…and a thin dime is bonus! Amazing what people sell! Picked up a quilt at a sale,asking the price. The girl said “oh,my grandmother made that for me,but it does not fit my colors!” Frankly I could not buy it in hopes she would change her mind and her paint colors! Oh, I love him! Great find! How could she part with him?